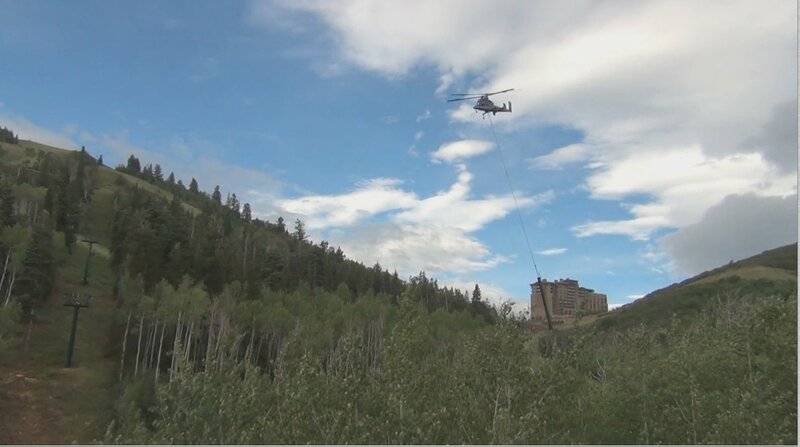 Last Saturday I went to shoot a video about a helicopter that was removing the old Deer Crest chairlift. 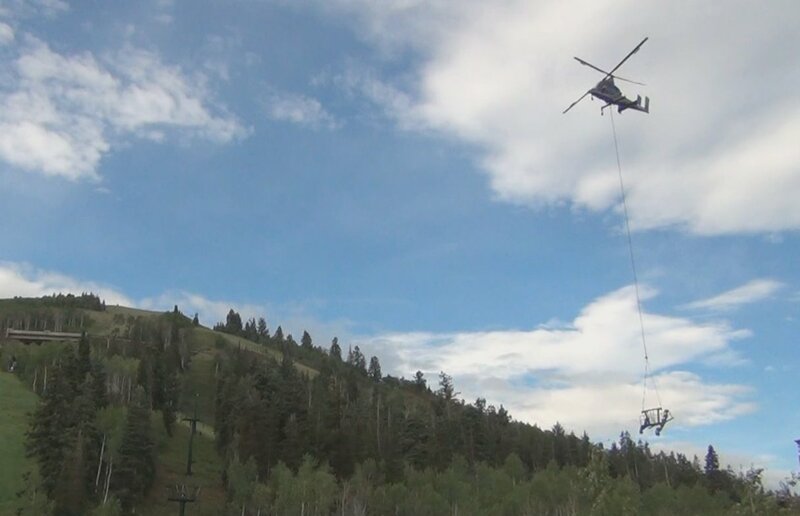 This job is a necessary first step before receiving the slightly larger towers that are being built for the new Mountaineer Express chairlift on Little Baldy Mountain at Deer Valley. 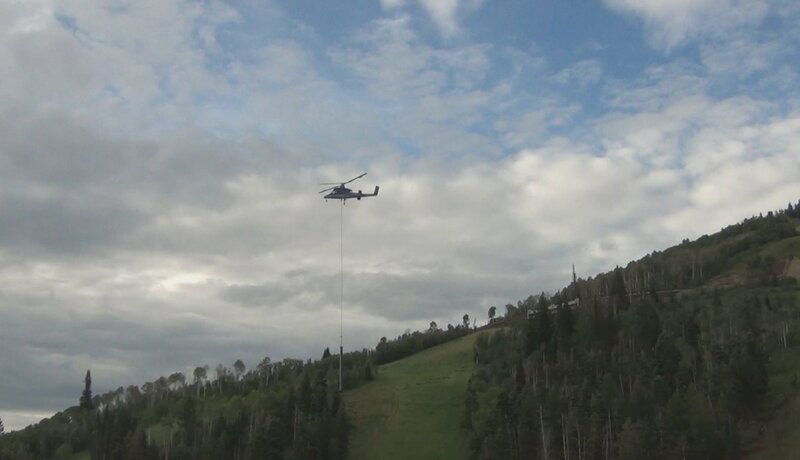 Before I even left home, I saw a strange helicopter flying by the Wasatch Mountains. 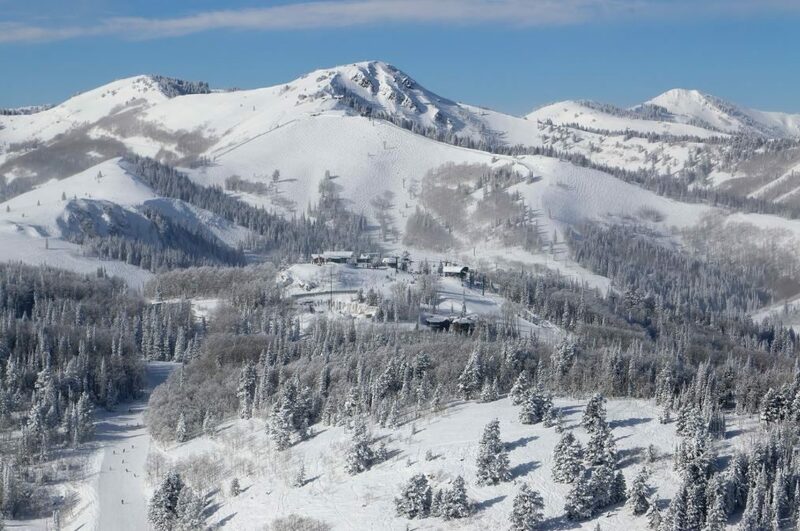 A few moments later, I was picked up at Snow Park Lodge by Chuck English, Deer Valley Resort’s Director of Mountain Operations. 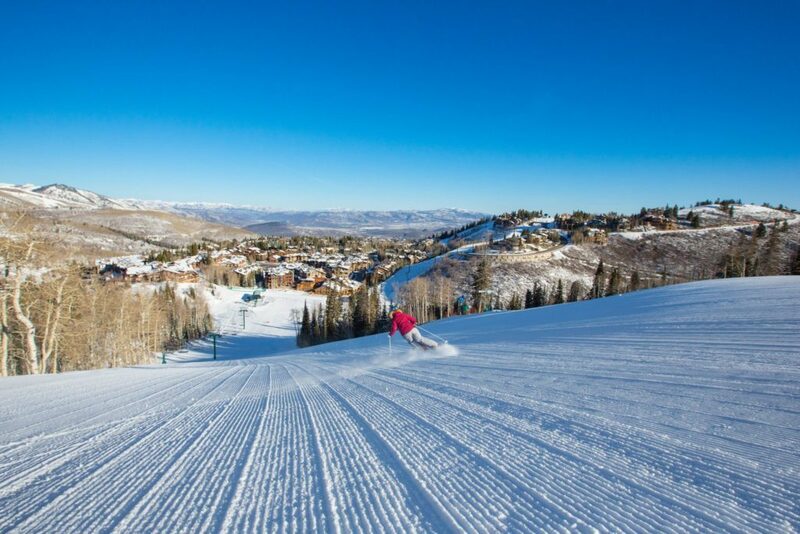 On the way up to the lift, Chuck explained that Dopplemayr, the company supplying lifts to Deer Valley, had orchestrated a complex and precise operation to remove the eighteen towers assemblies that constituted the Deer Crest chairlift and bring them down to the bottom of the lift in less than two hours. He further explained that the helicopter used for the operation was a very expensive piece of equipment, costing around $4,000 per hour of flight time. I knew a few things about choppers, but not much about the special machine that came that morning. That one was used for hauling timber, moving lift towers around or even fighting fires. The aircraft in question was a 1998 K-1200 made by Kaman Aerospace Corporation, powered by a 1,500 hp engine and owned by Timberline Helicopters, Inc. of Sandpoint, Idaho. This company is specialized in ski lift, power lines and pipelines construction, as well as logging among other diversified activities. This model, also called K-Max has two main intermeshing rotors but no tail rotor. 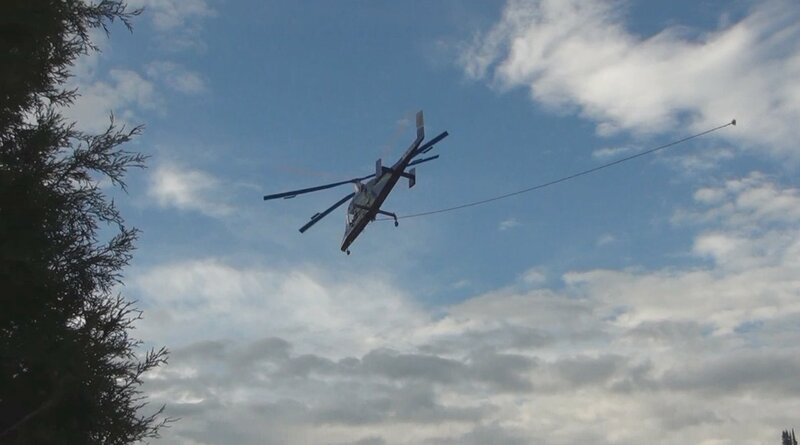 Its two rotors turn in opposite directions, with each rotor mast mounted on the helicopter in a slight angle relative to the other and in such a way that the blades intermesh without colliding. This original design is what allows the helicopter to function without the need for a tail rotor. This configuration is referred to as a synchropter. 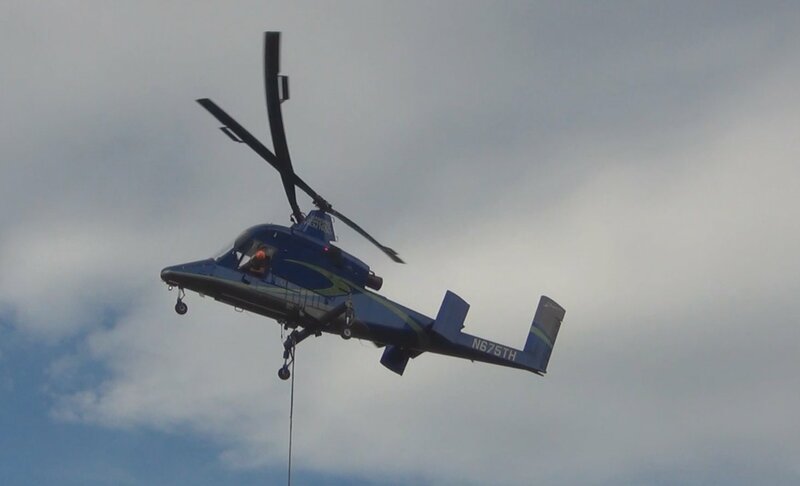 Such helicopters offer both high stability and powerful lifting capability, further they are more efficient, have a natural tendency to hover and are excellent for precision work in placing suspended loads. They’re also more responsive to the pilot’s control inputs, making it possible to easily and precisely swing a very heavy load; in fact, this flying crane can lift more than it own weight – 6,000 lbs – and while it burns an average of 85 gallons of fuel per hour during lift operations like this one, it remains the most efficient lift-to-fuel ratio of any helicopter in its class. Like on fixed-wing aircraft, the lift of the helicopter rotating wings is produced by its reaction with the surrounding air. The denser the air, the greater the reaction. As the aircraft climbs in altitude, the air becomes less dense, so the amount of lift is reduced. This is because the atmospheric pressure acting on a given volume of air is reduced, allowing the air molecules to move further apart. At some point in a climb, up into a high mountain environment for instance, the lift produced by the thinning air is only enough to maintain the altitude, but no longer enough to climb. This constitutes the absolute ceiling for the aircraft. The air density is not just a function of altitude though; the atmospheric pressure plays a role too; if the pressure is lower, the air is not as dense. Same effect with the temperature; as warm air expands, the air molecules move further apart, creating lighter air, but the reverse is also true as cooler air will create denser air conditions. Finally moisture influences lift as well; as the water content of the air increases, the air becomes less dense, decreasing performance. Increased relative humidity also contributes to that loss of lift. To illustrate these physical facts, the working crew that day was telling us that while performing a similar work at 11,000 feet elevation at nearby Snowbird, earlier in the week, the weather was so hot and humid that the helicopter had a challenging time carrying some of its loads. At times and when the parts allows it certain elements like the sheave assemblies must be removed from the cross arm that sits on top of a chairlift tower and be replaced later on. In terms of lifting performance, the K-Max cargo hook capacity is rated at 6,000 lb at sea level. 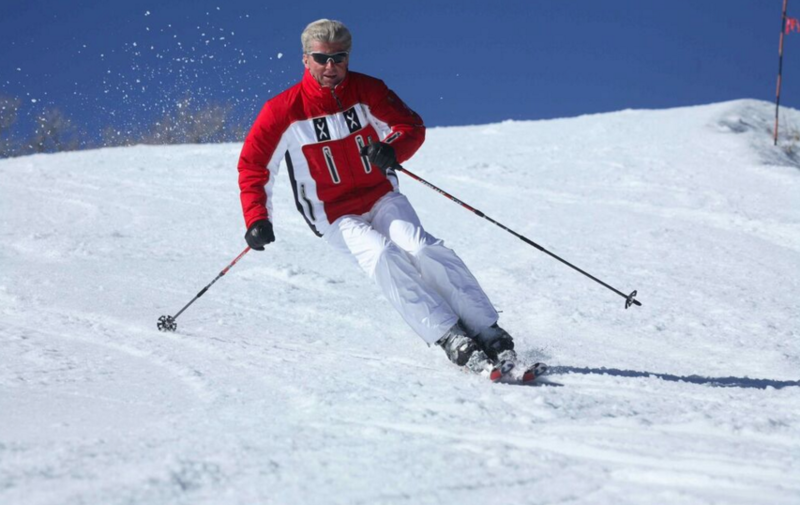 At 10,000 feet it’s about 5,163 lb and at 15,000 feet it falls significantly to 4,313 lb. I like the new chairlift mountaineer express it has 65 chairs.